The owner wants this guitar to brought back into great playing condition. So, let’s get it on the bench! The first thing to do is look it over. I start at the headstock and work my way down. Then check it from both sides from nut to endpin. Then flip it over and again go over it from top to bottom. We don’t want to miss anything! I’ve removed the truss rod cover. Everything that is taken off is put in a tray for safe-keeping. Anything that is going to stay off for a long time gets bagged (or boxed) and labelled. 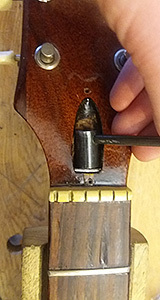 The cavity was jammed up with black paint and varnish preventing access to the truss rod nut. I carefully cleaned that away and eventually dug out the end of the truss rod. A full description of truss rods can wait, but I wanted to check that this one was functioning OK. I removed the nut and half-moon washer completely, cleaned up the area, lubed up the threads and the bearing face of the washer and put everything back. Good news: it works great!